Paul Ryan says that “the left” is offering Americans “a full stomach and an empty soul.” The truth is that conservatives like Paul Ryan are offering Americans empty stomachs and empty rhetoric . The American people want more than that. Near the end of his Thursday morning speech at CPAC(the Conservative Political Action Conference), Paul Ryan told a story about a boy who didn’t want his free school lunch. The story wasn’t true. Eloise Anderson, an aide to Wisconsin Gov. Scott Walker, did tell Ryan the story at a congressional hearing last summer, but she never met or spoke to any little boy who told her he didn’t want his free school lunch. The story was purloined from a book titled “An Invisible Thread.” The book is about a friendship between Laura Schroff and Maurice Mazyck. They met in New York in 1986, when she was an ad executive and he was an 11-year-old panhandler. The “brown bag” conversation did happen, but had nothing to do with school lunch programs. Ironically, Schroff and Mazyck are now partnering with No Kid Hungry, an organization dedicated to ending child hunger in the U.S., in part by connecting low-income students with federal programs like school lunches. It’s never a good idea to take anything that an aide to Scott Walker says as gospel. But Paul Ryan can’t even manage a decent copy-and-paste job on the economic data that he misused and misrepresented to support his screed against anti-poverty programs. He can hardly be expected to fact-check such a good-sounding story. Ryan’s story isn’t real, but the stigma attached to subsidized school lunches is. Lunchtime can be the most socially stressful part of the school day, for any student. Invisible, ever-shifting social boundaries crisscross school cafeterias. So much is riding on where students sit, or even whether they have friends to sit with. Students who get subsidized lunches have much more to deal with. Lunchroom practices sometimes reveal students low-income status to their peers. Some schools have separate lines for students receiving subsidized lunches, and students who buy theirs. Others have an “a la carte” line, where students with cash can buy items not available in the subsidized lunch line. A school in Colorado school stamped the hands of students who received free lunches or could not afford meals, and gave them cheese sandwiches, instead of the pizza their classmates got. At one school in Utah, workers seized lunches from students who owed money on their food accounts, offered them a piece of fruit and a carton of milk, and threw their hot lunches in the trash. In some Minnesota schools, students who can’t afford lunch are denied food; or they get peanut butter or cheese sandwiches, instead of what their classmates are eating. No wonder some students choose to go without lunch, and not face the stigma. School districts are finding ways to relieve that stigma. New York schools have held regular promotions, inviting professional athletes to eat subsidized lunches in their jerseys. Other schools have integrated lunch lines, and implemented cashless systems, so that all students go through the same line, and those receiving free lunches are less easily identified. 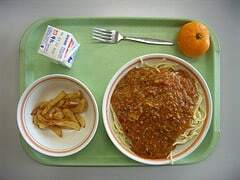 Boston public schools serve free school lunches to all students, even if their families are able to pay, as part of an experimental federal initiative, designed to make it easier for students from low-income families to get free meals, by eliminating the need to fill out forms. Kingston said his remarks were not targeted at a particular income group, but it’s a safe bet that students who can will buy or bring their lunches, and not have to clean up after their classmates. Kingston’s scenario would require “the children from poor families to stick around the cafeteria to sweep up while their better-off friends hitch off to recess.” Students who already skip eating lunch to avoid stigma might just skip school altogether. Kingston’s views echo those of other conservatives. They reflect a conservative agenda that blames the poor, stigmatizes those who need help, and shames those who receive help. Fox also attacked free school lunches under its “Entitlement Nation” agenda. Republicans are willing to walk their talk. Republicans in North Dakota and Vermont voted against subsidizing lunch or milk for schoolchildren. West Virginia’s “Feed To Achieve” bill ultimately passed in the state legislature, and was signed by the governor. House Republicans voted for food stamp cuts that would take free school lunches away from over 200,000 children, just to protect a tax cut for millionaires.